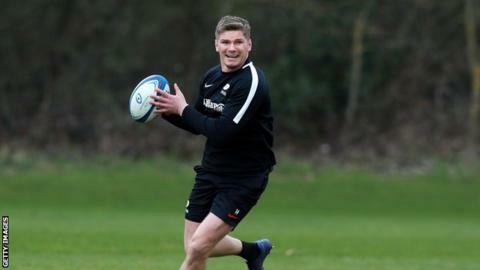 Nobody can question England captain Owen Farrell's commitment to his club Saracens. Picture the scene: it's 2.30pm. His wife Georgie has been in labour since the night before. They think the birth of their first child is a mere half-hour away. What does the fly-half do? According to Sarries head coach Mark McCall, he called to say he might still be able to make their Champions Cup quarter-final against Glasgow - which kicked off just 45 minutes later. "He phoned me at 2.30 and said 'in the next half hour'...," said McCall. "I said 'Owen, the game starts at 3.15! I don't actually know if he's had the baby yet. "We had a rough cut-off point. His wife went into labour last night. At 8.30am he was pretty confident it would all happen, but it didn't. The 27-year-old need not have worried on his club's behalf as Saracens back Alex Goode proved a worthy replacement, helping them defeat Glasgow 56-27 and reach their seventh Champions Cup semi-final. McCall hopes Farrell - who has not played for Saracens since before the Six Nations - is back in time for that game against Munster on 20 April. "We have a big game coming up and he does need to play a little bit [before then]," he added. Given how keen he was to be on the pitch today, Farrell will surely be back in good time.